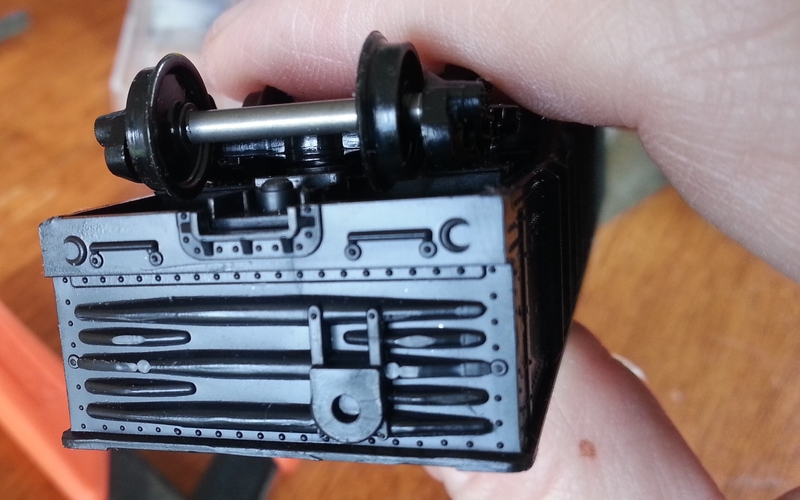 When I pulled the three castings out of the box I noticed that I’d been sold a damaged unit. The damage on the one unit was pretty severe; there was a major bend in the casting (most likely from long term storage under pressure, and the side had broken away from the bottom of the casting. I did consider repairing the unit, but in the end the Dr Frankenstein side of me came out. But, I digress and am skipping ahead. There is a fair amount of commonality in the build process for all three cars, and I’ll diverge the builds as needed as we go through them; just look for the ‘Pig’s ear’ label as we go through the process. 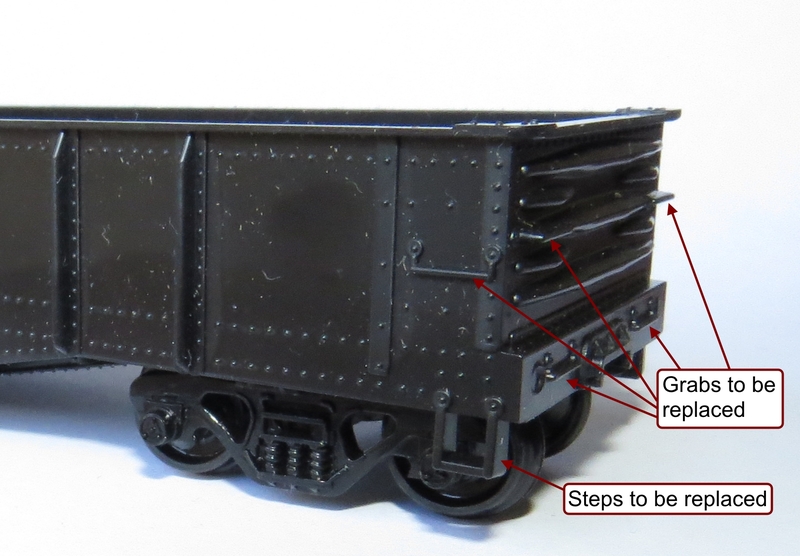 So this is where we started, we had a 1970’s era Athearn casting, with what I consider to be relatively good rivet detail, yet with the ugliest moulded on grab irons and 8 inch by 4 inch steps. See that in image 1 below. These three tools are about all you’ll need for the first part of the project. We’ll bring in some more later on as we get into the specialist parts of the build. Some of these well have to make, these are not too hard to make though. NOTE: Protective eye-wear is important to make sure that small parts are not ejected at high speed into your eyes. Tools generally are dangerous and can cut, twist, damage and otherwise destroy parts of your body if you don’t use them correctly. Andrew’s Trains takes no responsibility for your inadequacy with or lack of knowledge of tools. 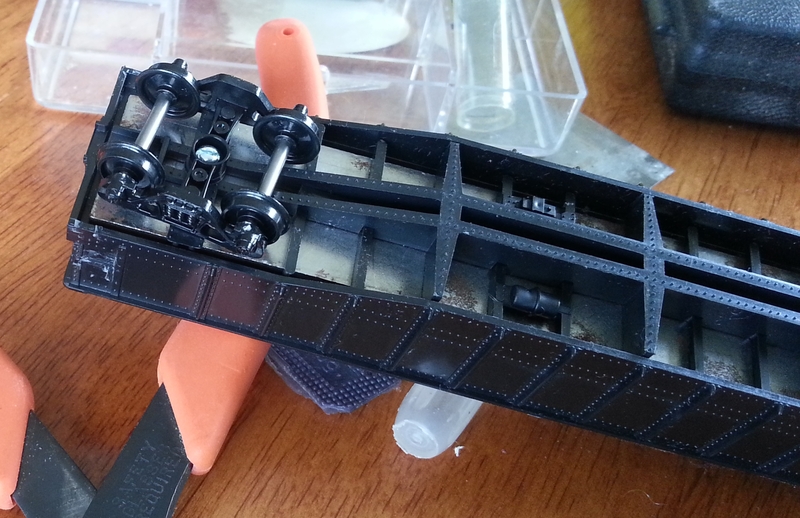 I generally screw all of the body parts together when I’m working on an old Athearn car due to the brittleness of some of the parts. 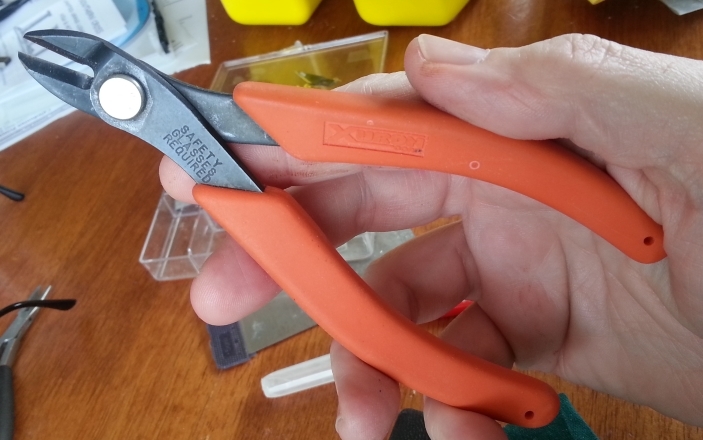 First remove the stirrups using your cutters (any kind will do, but I like the Xuron cutters because they are designed for cutting Rail and they leave a nice clean edge that is easy to clean up). Next you’ll need the #11 handle and chisel blade. I like the chisel blade for this kind of work because you can bend the blade to get it into place for removing the finer details. However, you must be careful in your movements because a little movement can remove a lot of detail. Work the tip of the chisel with the flat side of the blade against the model into place and then allow the blade to slide at an angle against the moulded on detail. This will remove the smallest amount of detail; repeat as necessary until you have the grab-iron down to the body level. What you’ll have left is what you see in image 3 below. The car ends are particularly awful with thick hand grabs on the strengthening ribs. No matter how careful you are here you’ll take some of the edge off the ribs. Again a simple clean up with initially 400 grit wet and dry before moving to 800 grit wet and dry to round off and polish the cuts made. You can see the results of the work under way in image 4 below. Thankfully the cars are small, and will hide the work done on the ends pretty well. I’ve tried to leave the ‘sort of’ poling pockets on the ends. In one or two cases these have been damaged but since the cars are just about end of life it is OK. And as I’ve always maintained if you cannot see the detail at 2 feet distance, it really doesn’t matter. In image 5 you’ll see the three cars stacked for convenience. The bottom car was the one that had been badly damaged in storage. The base was straight, but the sides were either badly bent, or broken and near off the car when I took a closer look at it. I tried to heat bend it back into shape using boiling hot water. The car side was so badly damaged from storage that this was never going to happen. There were stress marks in the plastic from too much weight bearing down on it. Along the bottom of the sidewall where it met the floor the entire car side had fractured from the base. So I got a little creative knowing that if nothing else I could keep the underframe for the future. Working on the principle that if a little hammer won’t move it, you should get a bigger hammer, I fired up my heat source and decided to make a side-swipe car for the RIP track. 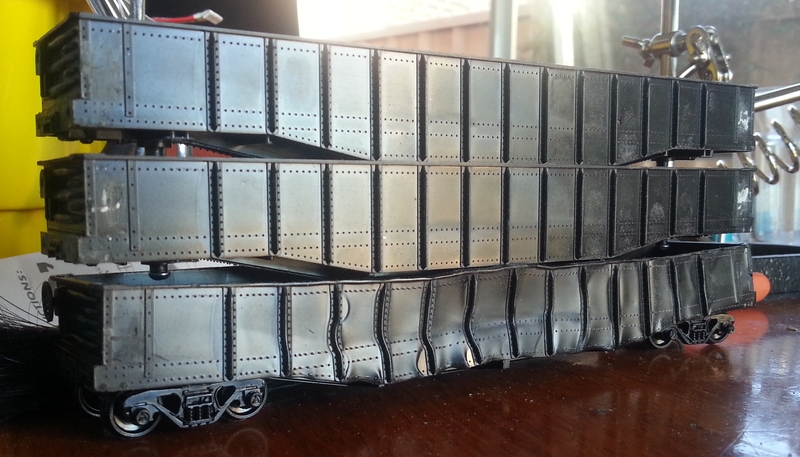 It’s not perfect,but will make a nice talking point on the layout, and can still be shunted about as needed. Using the chisel blade in the #11 knife holder I reversed the blade (making the flat side up) and angled the blade to about 30 degrees off the floor. 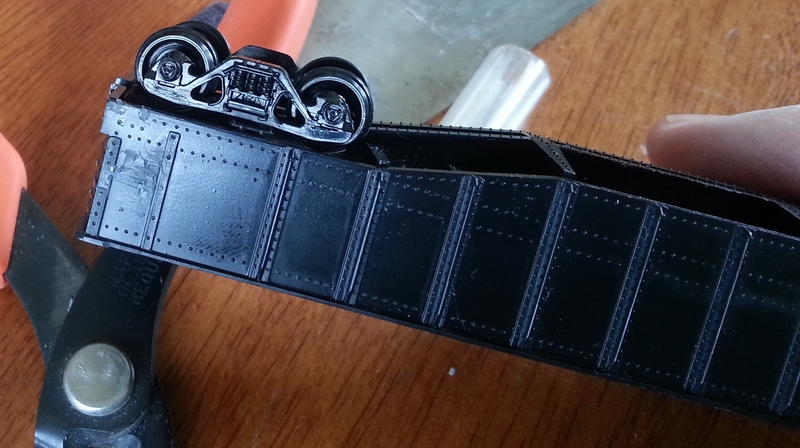 Then I simply went from one end to the other removing rivets by the score. You can see the results in one of the cars in image 6 below. The worst of the castings have been removed, the floors are cleared down and ready to be covered over with some scale wood siding that I have had for years, and the worst of the hacking has been cleared away (either filled and sanded or buffed out). Now it is on to the rebuilding phase.